Allow us to come to you and reduce any downtime in your working day. We currently run scheduled mobile fitting services throughout the central belt of Scotland covering the Renfrewshire, Glasgow, Motherwell, West Lothian, Edinburgh, Stirling, Kirkcaldy, Perth and surrounding areas. 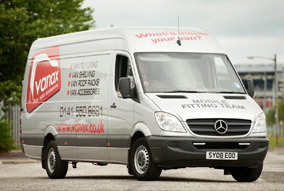 Our fully trained engineers are capable of fitting the majority of van accessories at your premises. Currently offered to account customer we service a large number of large fleets, contract hire and rental companies, main franchised dealerships and individuals who rely upon Vanax to ensure their vehicles are protected and ready for work as soon as they arrive. Once you are registered on our website and have confirmed that you are located within our current operating area, you will have access to both workshop and mobile fit options for all the products chosen. We require confirmation of certain van specifications to ensure the right product is chosen for your van. These include the wheel base and roof height, the number of side doors and whether your van has rear doors or a tailgate. Anything you are unsure of when placing your order, please let us know. Don’t worry. Not everyone has full knowledge of the exact specification of the van they drive. Our help section has useful advice and tips to assist you in identifying your current vehicle. When choosing your products you have the options.